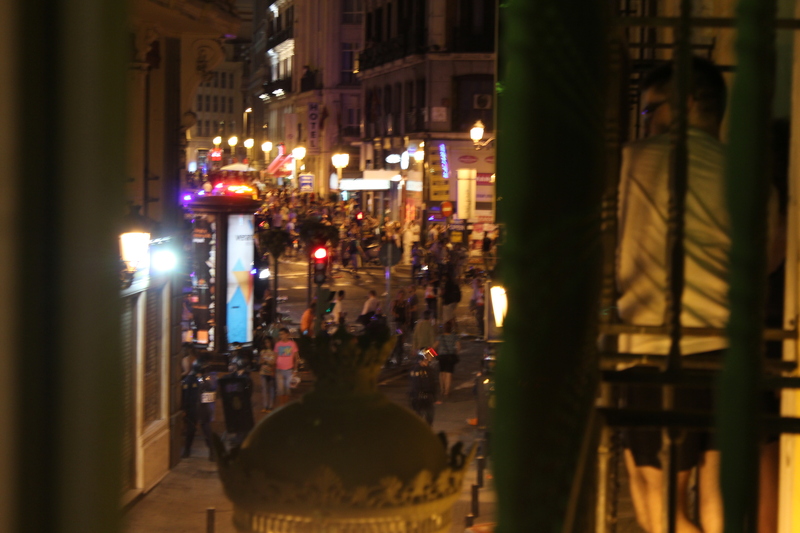 One of my friends took this photo from the balcony in my room at the hostel we stayed at in Madrid. This was later in the night, around 11:30. It’s just off of the Grand Via and, although the photo quality is a little poor (my bad, still learning to set the camera up properly), you can see riot police speckled everywhere and people running about. Earlier in the evening, all you could see were tens of thousands of people running to and fro-there were enough people to fill a football stadium with ease! I’m considering creating a new category for my blogs after this and the last blog. If I did, it would be called, “The Wrong Life Lessons I Learned in the Right Places to Learn Life Lessons,” because that’s what I’m doing. A quick little pre-cursor for anybody who may be viewing this blog under a different impression of what it will be-it’s not so much to do with the riots because realistically, we kept completely out of them. It’s about what they got me thinking about. Cool? Sweet. I’ll hop on with it. Obviously, I’m one confused little boy. My life is awash with indecision and unmade judgements of things. The reason I’ve been overseas is to try and piece together the little puzzle pieces that is my future. Not the distant future, things slightly closer at hand. Though despite how much closer they may be, they’re still as difficult to figure out. What am I going to be when I grow up?? There are so many options and I definitely don’t want what I want two years ago (I guess it’s kind of good that I dropped out of university huh?). Two years ago, I wanted to work strictly in the music industry, although my path was undecided. I absolutely love and adore music in near all its forms, and the music that I don’t like I adore the fact that somewhere, people out there are adoring it, just adorable. And I still want to work in music I guess, it’s just I got thinking about something else. The riots in Madrid occurred because the Spanish government passed a bill that would see huge and sweeping cuts to public funding all across the country, affecting most, if not all, public services. And the people were, quite obviously, a little bit unhappy about the whole ordeal. So all across Spain, people lined the streets to shout their protests. They weren’t having any of it for themselves or their fellow men and, in their seemingly infinite Spanish passion, they tried to change the world. So the riots really got me thinking about the world-about how big and how small it is. About what the world actually is, how do we define it? And then once we’ve defined it, what do we do with it? I would love to grow up and play guitar in a rock’n’roll or blues band. That would just be the coolest thing ever in ever. I’d just have such a whale of time-and one of the cute whales, like a killer whale! Ohh I feel a bit tingly just thinking about how awesome that would be! But then I step back and think hey-I wanna have a wife and kids one day-I really want to actually be there for all of it, which I can’t do if I’m on the road all the time. So I think about myself a little bit…I’m a pretty smart guy, truth be told. I always have been. This isn’t me being conceited, just honest. I try and do most things (if you barre anything post-2am on Oxford Street…) with the absolute best intentions for everybody in mind, whether they be friends or complete strangers. So um…why aren’t I trying to do this with my life as a whole? No no, refocus. Why aren’t I trying to do this with my career? It’s very difficult for me to put this in a way that doesn’t just sound wildly, in every sense of the world, condescending to other people but right now, I don’t think I want to spend my time working towards a career that won’t help other people. Now, this isn’t to say that music doesn’t help people but I really don’t think, unless I were to become a music teacher, that I would have the ability to impact on anybody’s world. Maybe my own, maybe it’d help me write a song to make a girl fall in love with me or help a student to do the same thing but it won’t change anybody’s world. I want to change the world, whichever world that may be. I’d love to be a writer maybe, but I’m not sure how I could use that to help the world-maybe a generous reader could tell me what to do? I’ve been toying around with the idea of going to law school and working for Legal Aid, helping those who are unable to help themselves. I considered social work or psychology and in all honesty, I just don’t think that that’s what I want to be doing with myself. Truth be told, I don’t think I’m strong enough to do that. And that’s okay, at least I realize that. Thanks to anybody who stuck around long enough to read all of this! Not sure if anybody noticed really, but I talked about sort of defining what the world was. I learned a fantastic lesson about that from one of my friends, without her even knowing I pinched this knowledge ;D So my next blog is going to be about that. It’s 5am and I’m not sure if I should bother getting some sleep or just rolling through the day and crashing early. Ehh, that’s a decision in my life that is, most definitely, unimportant.